Come join the Haldane Society of Socialist Lawyers in conjunction with the Haldane Feminist Lawyers at this special International Women's Day edition of our yearly human rights lecture series. 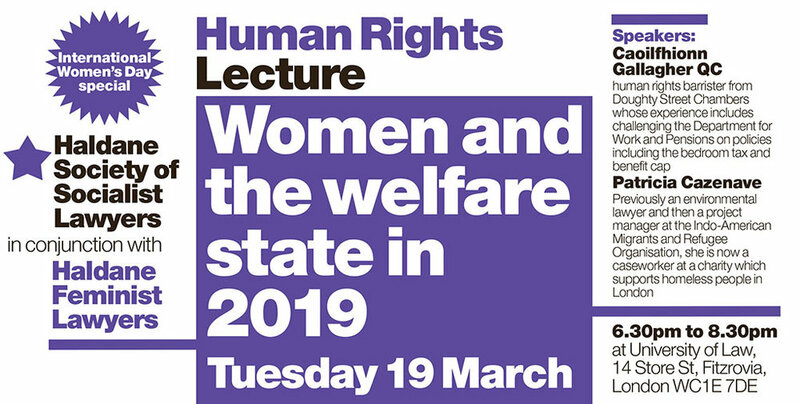 We will be discussing the state of women within the welfare state in 2019, including "benefits reform", the effect of austerity and fighting back against these policies. We will be hearing from Caoilfhionn Gallagher QC, a barrister from Doughty Street who have been involved in successfully challenging the benefits cap and the bedroom tax. There will be time for contributions from the floor, as well as questions and answers. Latecomers are welcome to enter quietly. The Haldane Society of Socialist Lawyers AGM will be held on Thursday 7 February 2019 at 6.30pm, at the Universtiy of Law. The AGM will also elect the Officers and Executive Committee of the Society. There will also be an informal discussion with Executive Committee members about socialist amd the law. Refreshments will be provided, and members will be invited to a social event afterwards. Please join us at the Turkish Embassy at 12:00pm on 24 January 2019 for the Day of the Endangered Lawyer protest. The Day of the Endangered Lawyer is the day on which we turn the spotlight on lawyers all over the world who are being harassed, silenced, pressured, threatened, persecuted, tortured. Murders and enforced disappearances as well are not out of the ordinary. The only reason for these outrages is the fact that these lawyers are doing their job, and fulfilling their professional obligations, when they are needed the most. The 24th of January was chosen to be the annual International Day of the Endangered Lawyer because on this day in 1977 four labour rights lawyers and a coworker were murdered at their office address at Calle Atocha 55 in Madrid. This is known as the Massacre of Atocha. The International Day of the Endangered Lawyer aims, on the one hand, to create awareness that the practice of the legal profession in many countries involves significant risks, including that of being murdered, but it aims as well at denouncing the situation in a particular country, where lawyers are victims of serious violations of their fundamental rights because they exercise their profession. Every year on 24 January lawyers’ organisations dedicate this day to the endangered lawyers in a particular country: 2010 Iran, 2012 Turkey, 2013 Basque Country/Spain, 2014 Colombia, 2015 Philippines, 2016 Honduras, 2017 China & Egypt. The European Democratic Lawyers (AED-EDL) established the Day of the Endangered Lawyer in 2010. Since then it has been coorganized by AED-EDL and the European Association of Lawyers for Democracy (ELDH) and the foundation “The Day of the Endangered Lawyer”. Many other lawyers’ organisations and bar associations have supported this project. In 2019 the Day of the Endangered Lawyer focuses on the endangered lawyers in Turkey. In all the cases which have been chosen as examples (see the attached Report) lawyers were accused just because of practising their profession. By so doing, the Turkish State systematically violates the UN Basic Principles on the Role of Lawyers and it is obvious that this violation has direct impacts on the right of defence. The Haldane Winter Party 2018 will be on 13 December 2018, at Garden Court Chambers. Advance tickets are £12 (full price) or £8 (student/unwaged/low waged). Tickets on the door will be £15/£10; we will accept cash or PayPal. Entertainment, drink and vegetarian food will be provided throughout the night, within your ticket price. Early bird tickets are no longer available: tickets can be purchased on the door either below, or with cash. On Monday 10 December 2018 a group of peaceful anti-deportation activists, the Stansted 15, were convicted of offences under the Aviation and Maritime Security Act 1990, a piece of legislation introduced in the wake of the Lockerbie bombing aimed at combating international terrorism. The Stansted 15 prevented the departure of a chartered flight deporting 60 people from the UK to Nigeria, Ghana, and Sierra Leone, many of whom were at risk of great harm if removed. The charge - endangering safety at an aerodrome - carries a maximum penalty of life imprisonment. The defendants were initially charged with the lesser offence of aggravated trespass: four months after the protest action, the prosecution amended the charge to the more serious offence of endangering the safety of an aerodrome. The decision to increase the seriousness of the charge, without any change in evidence, appears to be intended to dissuade activists from taking direct action. Of those who would have been deported on the flight, 11 remain in the UK to have their cases heard, while some have been granted leave to remain. Among those scheduled to be on the flight were recognised survivors of trafficking and slavery who had sought protection in the United Kingdom. It is a great injustice that it is those who have acted to save lives who have been convicted, rather than those who acted to put people at risk of death and persecution. The conviction of the Stansted 15 is a damning indictment of the Home Office and the UK Government's intolerance of criticism. Instead of reflecting on the hostile environment and what motivated the activists to take direct action, the government has subjected these brave individuals to a long and expensive trial which has treated their actions as equivalent to those of terrorists. We express our solidarity with the Stansted 15, and all those who take action against the cruel and racist immigration policies of the British government. We support the calls of the Stansted 15 for an immediate end to deportation charter flights, and for a full independent public inquiry into the government’s ‘hostile environment’. The Haldane Society of Socialist Lawyers is proud to host this meeting with speakers Richard Brigden and Anna Morris (barristers) and Ewa Barker (anti-fracking activist). The meeting will discuss the defence of protest, injunctions, and campaigning in light of the quashing of the convictions for the anti-fracking protesters - the Preston Road Three - and the resumption of fracking by Cuadrilla. The meeting will take place from 6pm to 8pm at Garden Court North Chambers, 3rd Floor, Blackfriars House Parsonage, Machester, M3 2JA. The Haldane Society of Socialist Lawyers invites you to our free public lecture, Mental Health, Austerity, and Capitalism. The lecture will take place on Thursday 29 November 2018 at 6.30pm to 8.30pm, at Room S101, University of Law, 14 Store Street, London, WC1E 7DE. Sophie Talbot: Disability Labour national executive member.